Whenever I am in London and have a few hours to spare, I do the things I love the most here: walking and looking at art. I am always uplifted and inspired by these experiences. Yesterday, I walked in Green Park and captured this daffodil laden view of Buckingham Palace. Daffodils are one of my favourite flowers. Partly because they are cheerful, yellow harbingers of spring and partly because they bring back my childhood memories of playing in a spring garden at dusk, inhaling their lovely scent. Seeing them in full bloom in Green Park surfaced all these connections. For my art fix, I came across a magical small exhibition of mainly pastels with some oils by the Impressionist artist, Degas (18 34- 1917) at the National Gallery. This collection on loan from Glasgow in Scotland, features Degas’s well-known subjects of ballerinas, racehorses and women attending to their toilette. If only one could draw or paint movement as he did! I have also been inspired recently hearing about a new vineyard in Buckinghamshire: Dinton Wines, which was started in 2013. Dinton Folly, an English sparkling wine, is the brainchild of retired countryman Laurie Kimber, who planted 15 acres with the classic varieties of Pinot Noir, Chardonnay and Pinot Meunier on a south-facing slope with chalky soil and temperate climate. The neighbours of Mr. Kimber, and his family including his children, grandchildren and even great grandchildren harvest the grapes. The first harvest was ready in 2016. Dinton Folly is so named because of its proximity to the ruins of a nearby castle and also refers to the idea of taking on such a challenging project later in life. Dinton Wines is an inspiring testament to the fact that it’s never too late to start making wine! Dinton in Buckinghamshire is close to the Chiltern Hills, a famous place for hiking in the English countryside with picturesque villages and friendly pubs! Grape picking neighbours of Mr Kimber introduced me to this wine recently. I was delighted by the refreshing, dry, balanced, sparkling wine with its appealing lower range alcohol level of 11.5% ALC. Perfect to enjoy on an English spring day: Inspirational! Maps courtesy of Dinton Wines and local tourist information. Walking through central London, we look towards Piccadilly as we cross the Haymarket, and there they are: the magical Christmas Lights suspended across the road. White bright, shaped liked antlers, and proclaiming this particular area of London: St James’s. As we gaze up the street, a double-decker bus turns onto the road and transforms the view into an iconic vision of nighttime pre-Christmas London. Out comes my camera in a flash…and click. A friend says this photo brings back nostalgic childhood memories when his Mother would take him as a young boy to London to see the lights and look in all the shop windows. Photographs have that power of recall. Powerful images are what our afternoon and early evening are all about. 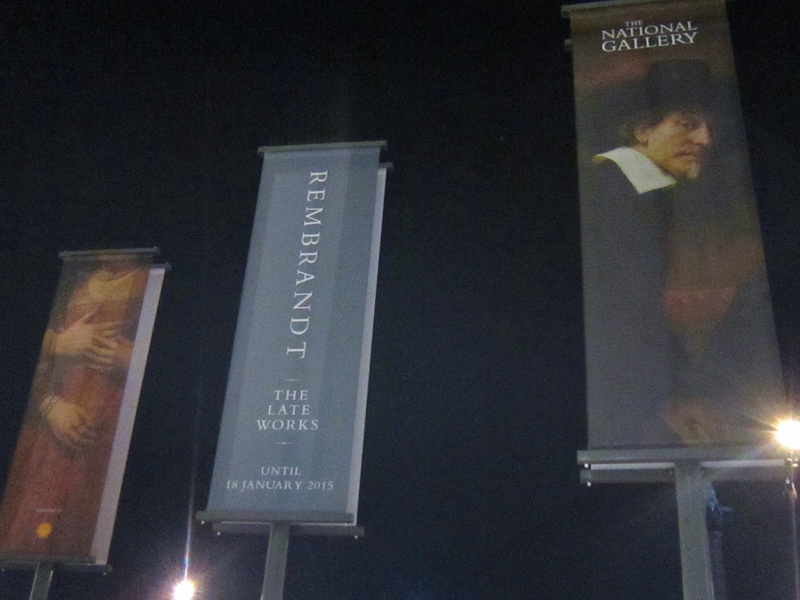 The Rembrandt exhibition of Late Works at the National Gallery catches our attention and we spend one and a half hours towards the end of the December afternoon viewing the works of art. In an age of instant, mobile phone camera generated images, we catch our breath looking at the detail, size and scope of Rembrandt’s masterpieces, trying to comprehend the extent of his talent and skill in capturing texture, light and emotion in paint and wondrous colours. The poster for the exhibition shows a portion of his painting “The Jewish Bride”, painted about 1665 just a few years before his death. Rembrandt lived from 1606 to 1669. This exhibition covers the period of his life from 1650 – 1669. We slowly make our way around the exhibition, headphones clamped over our ears, listening to the commentary about key works of art among the 91 on display. The paintings of faces, including the self-portraits, their complexions and eyes and the paintings of richly textured fabrics resonate with me. “An Old Woman Reading”, oil on canvas painted in 1655, particularly catches my eye. To spend time lost in the contemplation of art in this way is a great joy and escape from the rest of the world. We decide that when we come to the end of the exhibition we will head straight to the National Gallery Dining Room for a glass of wine with something to eat and take the time to decompress from this experience. The food menu is comprehensive and contemporary with selections such as quiche, soups, salads, grilled sandwiches and many other options. We decide to have their plate of Artisan Cheeses, selecting Berkswell (sheep) and Tickelmore (goat) cheeses with apple chutney and crackers. These are good. We examine the wine list, which is varied and all reasonably priced. There are no English wines on offer but English beers and ciders are featured. 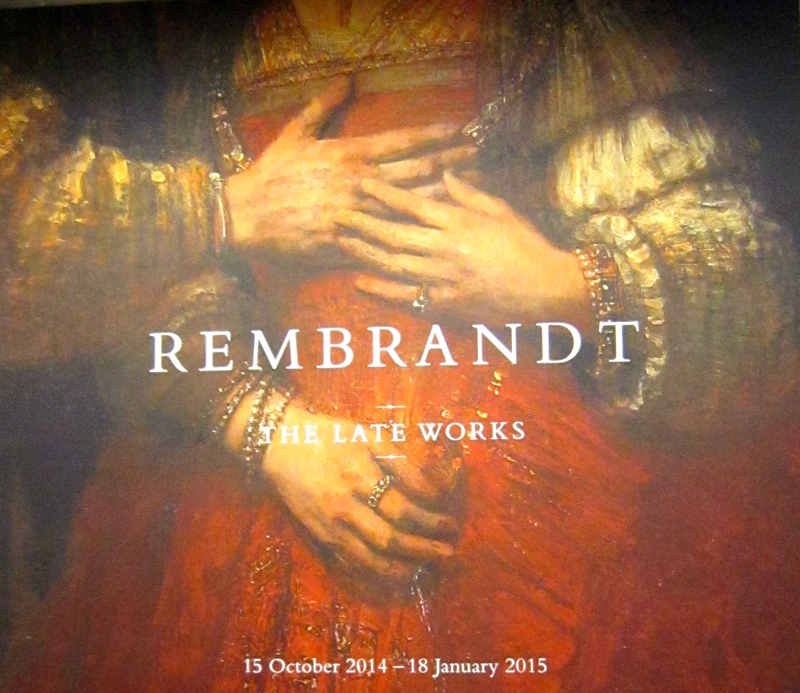 The flagship menu offering for the exhibition is called the Rembrandt Special featuring a grilled sandwich and a glass of their red or white house wine, priced at 10 GBPounds. I decide to try the white house wine, a Vin de Pays d’Oc, 2012, which I find overly acidic for my palate. My husband chooses a Pinot Grigio, Alisios from Brazil, 2013 and that is more to our liking: refreshing and with mineral flavours. This Brazilian Pinot Grigio, which is sometimes blended with Riesling, is a new experience for us. We like it and feel resuscitated after our wine and cheese interlude. We step out of the National Gallery and to our surprise find winter darkness has already descended. We entered a different world for a time. 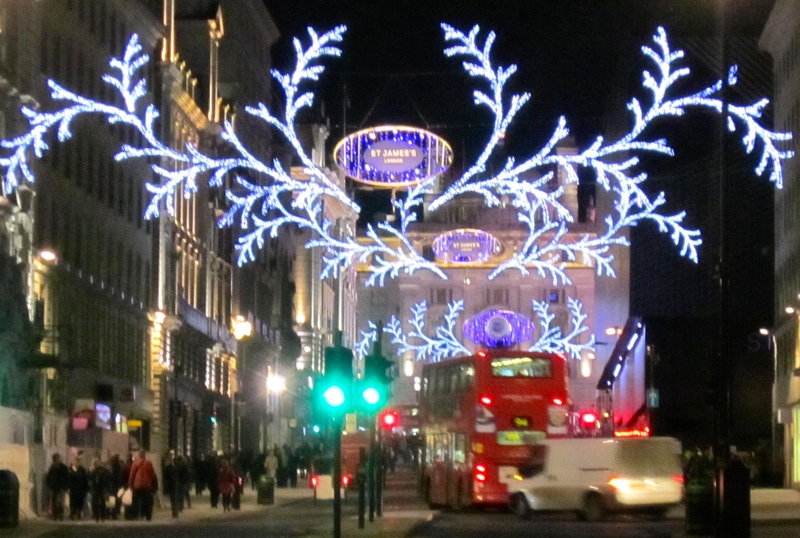 Coming across those white bright Christmas lights as we cross the street intensifies our experience of London magic.